Where is the University located ? It is located at Plot No. IS-2036 TO 2039, Ramchandrapura Industrial Area, Vidhani, Sitapura Extension, Jaipur-303905. The JECRC University campus is located in Sitapura which is within 25-30 minutes drive from the heart of the city. Sitapura has now become the Educational hub of Jaipur with maximum number of students studying and living here. Interestingly, it is also a place where most of the industries like Gems and Jewellery, Textiles, IT parks, etc. are present. Who are the promoters of the University ? Is it accessible by public transport ? Does the University have its own transport facility ? The University has its own fleet of vehicles for transportation and is on payment basis. What are the University transportation charges ? The University transportation cost for the Academic year 2019-20 shall be Rs. 27,000 (Rs. 15000/- at the time of Admission and Rs. 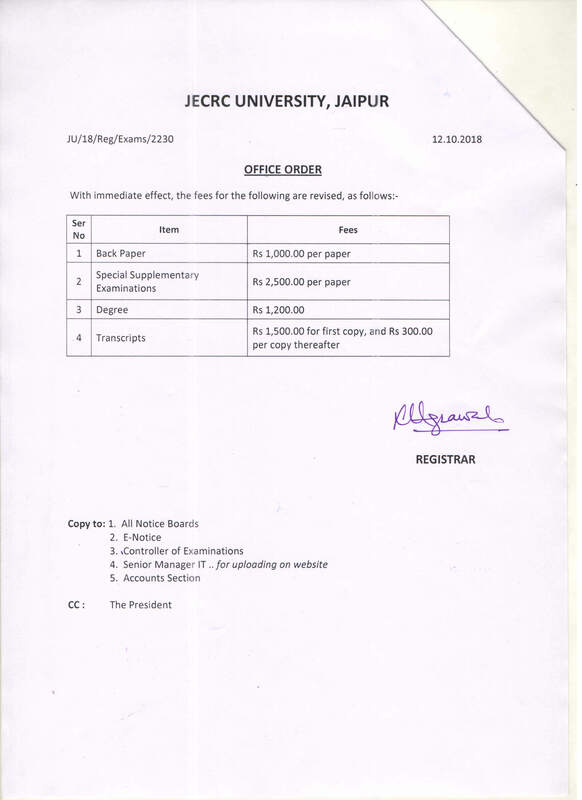 12000/- in the Second Semester) per annum. Is there Hostel facility ? Yes, separate hostels are available for Boys and Girls. The housing facilities for the students at the campus have been very uniquely designed giving them individual rooms with a common living room shared for three members. Air-Conditioned/ Non Air-Conditioned apartment style housing with a common living room equipped with dish TV (Caution deposit applicable), free internet facility which makes it a complete, comfortable housing unit. What are the Hostel Charges ? Hostel Fee includes food charges @ Rs. 30000 for Odd and Even Semesters. 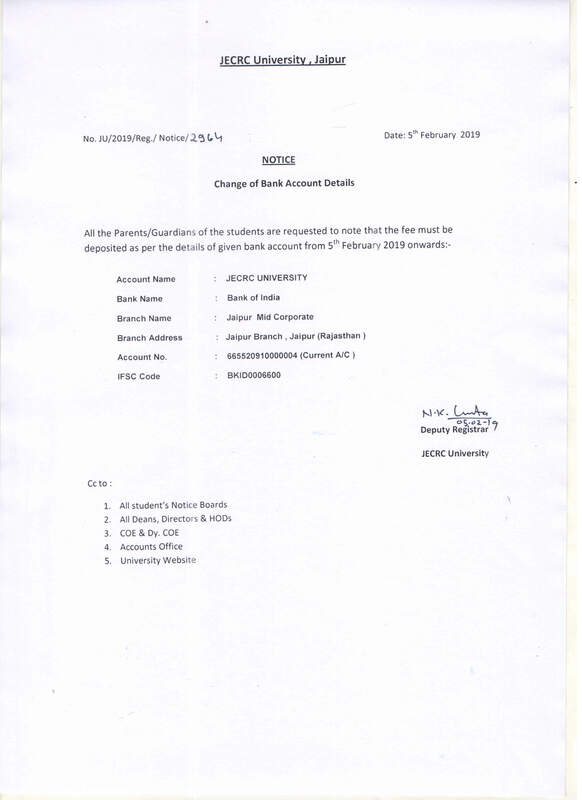 In case a student avails hostel in either of the semester, the fees chargeable shall be 60% of the annual fee. Will Campus placement be organized ? Yes. Placement activity is a strong hold of JECRC Foundation. The Foundation has set an exemplary placement record with its students being chosen by industry leaders, year after year. It has been hosting the 'Stand-alone Recruitment Drives', where leading business houses participate to test the mettle of the students of JECRC. Owing to its consistent performance in recent years, JECRC Foundation receives top-notch companies every year exclusively for recruiting its students. What are the possibilities of studies abroad ? Provision exists for a part of studies at foreign universities through Global Outreach Programs by JECRC University. What are the activities for over all development of student ? Over all development will be transfused through curricular and extracurricular activities including expert talks, industry visits, personality development, communication skills, various cultural functions and sports. Is the library well stocked and equipped ? Yes, a huge, well stocked JU Central Library is available and is designed with excellent learning resource both with text books, reference books, magazines, journals and also with access to online journals. Does the University have a tie-up with any bank for educational loan ? Since we are an approved University, all the Nationalized banks would be eager to provide loan facility to our students. Are your degree programs recognized by the Govt., Public and Private sectors ? Yes. The University has been established with due approval of the State Government. How will the JECRC University courses compare with other Govt. and Pvt. University Courses ? In JECRC we are committed to pursue the recommended courses and syllabi of RTU. In our University, we have improved upon the course structure and syllabi .The courses have been devised looking into the present market requirements after due deliberations with experts from industries. We plan to prepare students as per the global requirements. The students will not only be able to pursue higher studies in foreign universities but also join their program in midstream. In this sense, our program will compare very well with other Universities and will compete with RTU and other universities. Is Gymnasium facility is available at JECRC University ? Yes, Gymnasium facility is available at JECRC University. Gymnasium Fee: Rs. 1000/- Per Semester (Optional, Only for Hostellers). 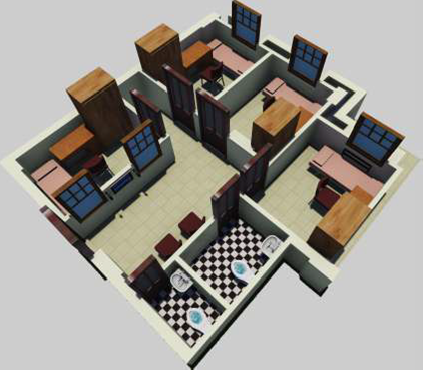 3D Rendering of the Hostel Rooms. The Housing facilities for the students at the campus have been very uniquely designed giving them individual rooms with a common living room shared for three/ four members. Air-Conditioned/ Non Air-Conditioned apartment style housing with a common living room equipped with Dish TV (Causion deposit applicable), free internet facility which makes it a complete, comfortable housing unit.